Blue Raster is excited to announce the Demographic and Health Surveys – MEASURE DHS mobile application is featured in a new case study publication by Adobe. 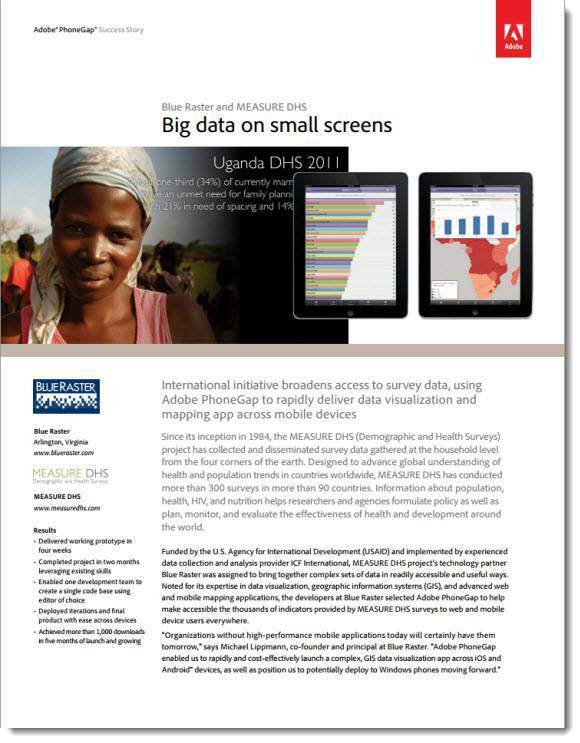 Leveraging Adobe PhoneGap and Adobe PhoneGap Build, Blue Raster developed and deployed the application which enables users worldwide to access key demographic and health survey data provided by MEASURE DHS surveys. Since launching, the application has already achieved more than 1,000 downloads. See how Adobe PhoneGap and Blue Raster made it possible http://adobe.ly/11kdoB2. Get the app for your iOS or Android device today!